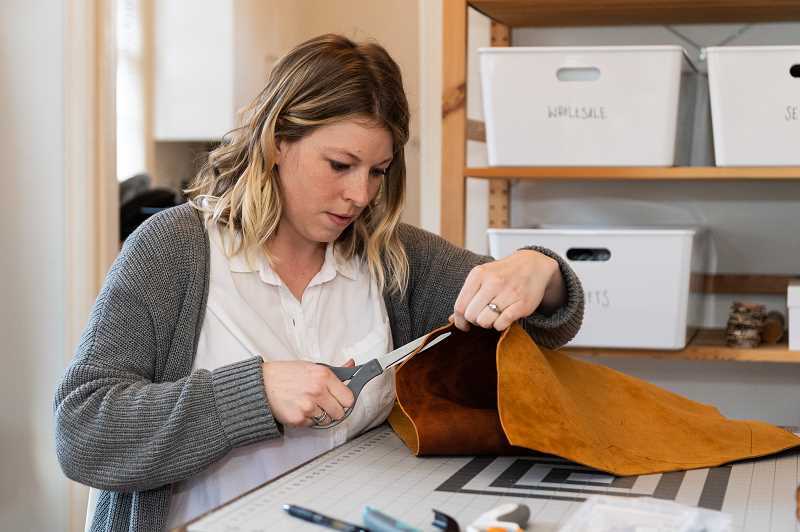 Alise Sewell, 31, is spending a sunny afternoon in her one-bedroom home in Hillsboro, cutting leather from a traced design at her workspace. A "coffee educator" at Dapper & Wise Coffee Roasters and Insomnia Coffee, Sewell designs curriculum for baristas and books artists to be featured at the Insomnia Coffee locations around Washington County. But today, Sewell is honing in on something near and dear to her creative side: Branch Collective, a passion project that she has turned into a way to make a bit of extra income. Sewell isn't alone in having a side hustle. Nearly half of Americans have one, according to recent surveys. They are particularly common among millennials, adults in their mid-20s to late 30s. 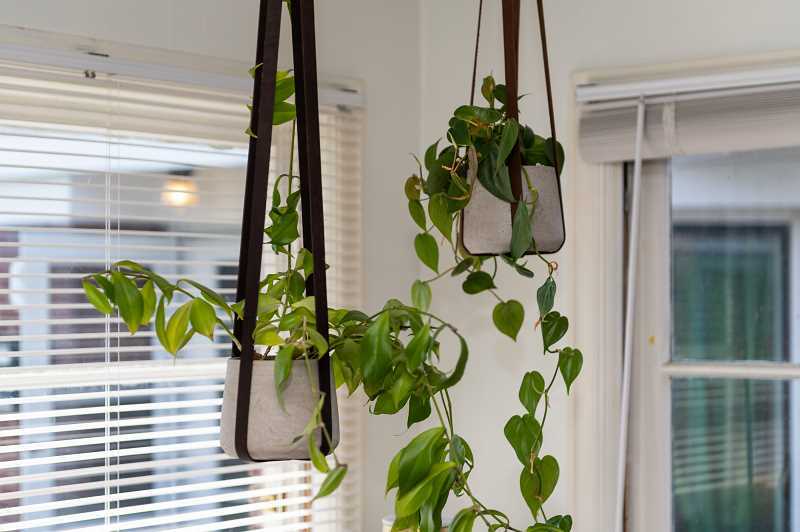 Branch Collective takes raw materials, including leather, hammered copper and wood, and transforms them into something new and beautiful: jewelry, plant hangers, dog leashes, clutches, key rings, laptop envelopes and more. The brand is featured in brick and mortar shops like Perks of Art in downtown Hillsboro and Crafty Wonderland in Portland, as well as Insomnia Coffee's various collections. "This is something I love," Sewell said. "I've been creating forever, and getting to put a name to it and call it Branch Collective, it gives me boundaries and what I can say yes and no to. It gives me a brand, and I think about things in terms of does this fit with my brand." Sewell moved from California six years ago and became a barista at Insomnia Coffee. As the company grew, Sewell grew with it, earning promotions and working her way up. 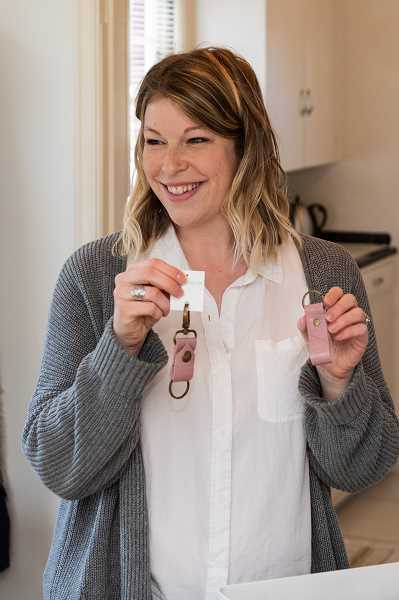 She pursued Branch Collective two months after she married her husband, Tim Sewell, a certified flight instructor at the Hillsboro Airport, in 2016. The idea came out of people in her life witnessing her love for forging new ideas, and would ask her to make things for them. They wanted to see her portfolio or website, both of which Sewell did not have at the time, she said. "My husband said, 'You really should,' and I kept pushing it off," Sewell recalled. "When I decided to do it, I thought through my values first. Branch Collective happened because there is a lot of meaning there, but the organic nature of it and everything has that feel to it — stone, leather, cloth, metal — they are all about me being inspired of nature. "The word 'collective' comes out of this idea that nothing is done individually — we are all influenced by other people, things, our surroundings, our upbringing," she continued. "For me, it was inspired by family and people who have taught me. (With) what I can do, I want to inspire others as well." Teaching as a career bleeds into Branch Collective, where Sewell teaches others leatherworking at Perks of Art in workshops. The owner, Melissa Joy, is someone Sewell said inspires her. "She is the most amazing woman, and cares deeply about the community and artists," she said. "I've been renting a space there for a year now, and it is just amazing. I was able to watch it open and start, and I thought I would like my stuff there someday." In turn, Joy sees the response to Sewell's work every day, she said. "Just today, I had someone look over and say, 'Hey, that's Branch Collective,'" Joy said. "That is the beautiful gift of having a shop presence, is having your brand seen and it lives somewhere, so people can come feel your product. Having Alise and her presence, it is a breath of fresh air, and there is an integrity behind everything she creates. She is a strong human being and an artist. One of my greatest joys as a curator." People start making art because they enjoy the creation and sharing with a wider community, not necessarily because they're trying to make money, Joy said. "The transition for creating for fun and to sell, that is one of the specialties in the shop here, is recognizing when an artist makes that move," Joy said. "Alise balances the craft with the business. It is not for everybody. She loves her other job as well, and Branch Collective fulfills her. Dreams take a long time to actualize, and when an artist transitions, like Alise did, from creating, to creating with selling, and balancing that with another job — that's where the artists you can really see (what) their heart is calling them for." When asked if she felt like a "creative," Sewell said she sees herself more as a "maker." "'Maker' is the idea that I am not bound by one medium and can be creative by working with my hands," Sewell said. "We live in world saturated with technology, and screens in front of us, and to push the pause button and see something tangible and have the raw materials, and making it into something usable, it feels like what we were designed to do as humans." Family is the first thing that pops into Sewell's mind when asked where she learned how to make and create. "My mom is the main person who has inspired me and values of creating and aesthetics. I love art, and my mom taught me how to sew when I was a 5-year-old," she said. "Learning design, I wanted everything to be symmetrical, and she broke me of that by teaching me how to do groups of odd numbers, because things look better in threes and fives." Sewell's mother designs jewelry until this day. She isn't the only member of Sewell's family who constructs and designs. The wood from jewelry comes from Sewell's father, a carpenter. The leather is from her uncle, who sent her a box of scraps from his shop in New York, where he makes goods like vests. "His scraps are the perfect size for my main things," Sewell said. She doesn't let any material go to waste, using it down to the smaller items like petite leather earrings. "Everything has a use and a purpose," she said, carefully cutting a scrap of material. After growing with Insomnia Coffee and trying to live in Portland, Sewell found herself putting down roots with Branch Collective in Hillsboro. "I was honest with myself that I am a small-town girl. I grew up in Alaska, and I just realized this is my home," she said. "I think the more I met people here, and the connection with art, that meant a lot to me. If I try to take on the whole world, I will overwhelm myself. If I can impact my community, that is what I can do, and that is awesome." While her work is on view for others away from her everyday life, Sewell loves to meet customers who purchase when she's set up at farmers' markets and art fairs in the past. "One lady came up and found a necklace she liked, but it wasn't long enough for her," she said. "She asked if there was a chance I had a longer one, and I said I could make it for her on the spot with my tools. I customized it for her right there, and she felt so special and ended up commenting on my Instagram page later. Those are the interactions that make my day, when I can help people feel seen. I hope (what) people take away from my products are those values of enjoying simplicity in life, and that is why all my designs are clean lines and minimal." Joy said Sewell is a leader in curating art in the community, not only by featuring her own work, but also by bringing artists into Perks of Art from the community. "She has a kindness about her that makes her approachable, and her art reflects that," Joy said. "There is an authenticity to her and her work that is unique and special." For those wanting to make their passion projects a reality, Sewell's simple advice is "put yourself out there." That's what she tells artists first showing at Insomnia, she said. "I love to give them their first platform, and it looks scary to do that, but you could put yourself out there to be rejected, (and) that is OK," Sewell said. "Go out and find your people, and know (that) what message you have to offer is important." To learn more, visit Branch Collective's Instagram @branchcollective or visit branchcollective.store.